With a refresh of the roomy and soft-riding CC7500 Fisherman, this latest iteration takes a proven hull and updates the interior layout to meet the current demand for boats well suited to soft bait fishing. In June 2007 when we tested the original prototype, this boat was an experiment to find out whether or not this style of hull would be accepted in New Zealand. During that test, we noted that the hull rode well and it was relatively dry for an open boat. However, the interior layout left much to be desired. Fast forward to 2011 and although the original model may have been ahead of its time, centre consoles have now firmly established themselves as the layout of choice for serious fishing, especially among those who use new generation soft baits and hybrid lures. We were keen to see how Atomix have refined their 7500 Fisherman's layout and whether it was now up to the New Zealand market standards. And in a word – yes. This model is a significant improvement on the first prototype. Atomix have quite wisely left the proven Bakewell-White designed hull untouched, retaining the same, extreme deep-V profile. The 25-degree deadrise creates a smooth ride, effortlessly cutting through chop and swell, while the high gunwales provide thigh-high support all around the boat. And the higher bow means that, despite the lack of a cabin, the boat is surprisingly dry, something that is further assisted by the slightly bow-up running position of the boat, ensuring that little of the chine's spray finds its way on-board. The downside of a deep-V is that it has a slight tenderness at rest – the prototype version suffered particularly from this. However, the new interior fit-out provides the boat with slightly more weight, ensuring it settles down further and is much more stable. The prototype had a tendency to lean but this has been mostly eliminated in the new model, despite it retaining the same 2.37m beam. Stem to stern This is definitely a big boat: with an overall length, including bowsprit, of 8.34m it has plenty of room for accessories. The bow features a fully automated capstan, with a large Manson anchor tucked snugly up inside the bowsprit. Somewhat unusually, the anchor well is only accessible through a small port on the front deck although, in practice, this provides ample access should a tangle occur in the rode. In terms of the layout, a new U-shaped bow seat is the first major change. This settee-type seat gives the boat somewhat of a bowrider style, with large squabs upholstered in vinyl. There are two large under-seat storage areas and brackets are installed for fitting an infill squab to create a day bed. 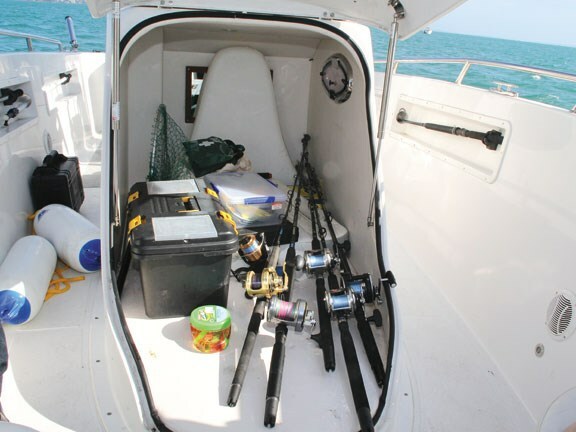 Although the seat does slightly reduce fishing access to the bow area, it is still possible to work a lure down the whole length of the boat. Storage to burn The other significant improvement to the boat is its centre console, and a newly integrated module has been developed. A generous, forward-facing seat – with a padded squab providing a full-length bunk for one, or an intimate space for two! – lifts up on pneumatic stays to reveal a cavernous interior. A small window provides light and air while the squab lifts up to reveal an electric toilet with holding tank, essential for extended trips with the family. When not in use as a cabin, this area forms a massive storage area. It is also lockable – a useful feature for boats stored in marinas or boat parks. Thanks to its length, a seven-foot fishing rod fits easily into the space along with other similarly elongated items such as gaffs and boathooks. Moving further back, the helm position is well set-up, with a generous, wide dash that has more surface area than most boats. The review boat was fitted with a modest Navman Trackfish 6500 chartplotter/fishfinder with a five-inch display. However, there is room for at least an eight-inch screen. 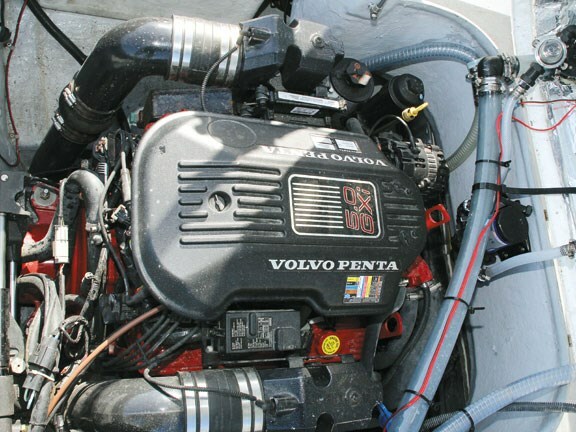 The gauges for the 270hp Volvo Penta GXi engine are spread around the dash with separate switches for accessories like the trim tabs, anchor winch, horn, bilge blower and so on. A Navman 7100 VHF is fitted, as is a JVC stereo system under a waterproof cover. Steering is via the Volvo power-assisted hydraulic system. The throttle lever is well located and light to operate. One of the difficulties of a centre console layout can be the storage of small items like keys and cellphones. However, Atomix provides a wide shelf area in front of the instrument binnacle. Protected by the windscreen, and even in the absence of the optional clears, it would be a good place to keep things dry. A double-width bench seat with backrest provides comfortable seating for two at the helm position, although the seat position is not adjustable. 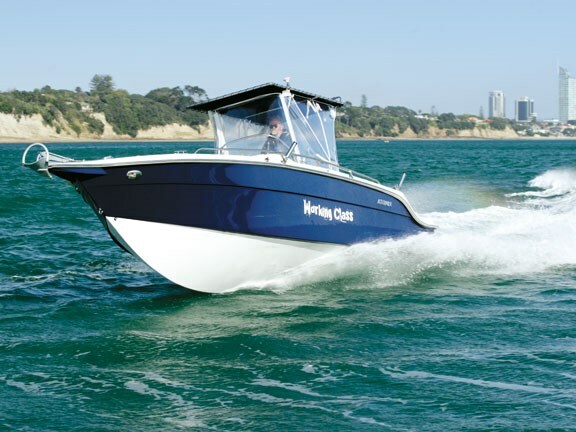 With the optional T-top and clears fitted around the console, the boat becomes one that can be used in all weather: the top offers shade for a sunny day and, combined with the clears, provides a rainproof shelter for two people. 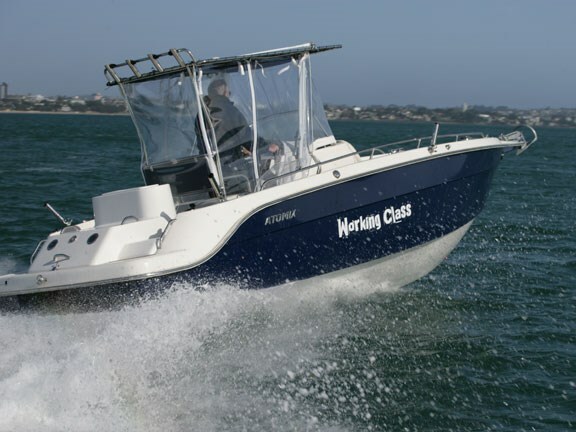 Our test boat's owner, Dean King, has gone the whole way with the clears, choosing the fully-enclosed option that stretched all around the helm position, effectively creating a completely weatherproof "cabin". He also specified the wide 'wings" to the clears. These extend from the helm to the gunwale, keeping spray away from the rear seats and ensuring the rear half of the boat is about as dry as it would be on a cabin boat. Behind the helm station is another Atomix innovation: a livebait tank and bait station built into the engine cover. Fully-plumbed, the hatch serves as a bait board or flips up to give access to the live bait tank. It is a comfortable height, the only disadvantage being that it tilts up with the engine cover. Either side of the engine compartment are two moulded seats that also serve as access points to the huge boarding platform. The area bristles with handholds, guarding against a man-overboard situation, and includes a boarding ladder on the port side (tucked neatly away under a moulded cover) making it easy for swimmers to get back on-board. Under the hood Hidden under the transom moulding is the lockable engine compartment. Pneumatic stays assist with raising the hatch and there is plenty of space inside, even for the big V8 Volvo Penta five-litre GXi. Powering the boat via a Volvo Duoprop stern leg, the engine gives good performance while counter-rotating propellers negate any prop-walk when manoeuvring at low speed. On the water A windy test day provided the opportunity to throw the boat around in some rough water, revealing the handling abilities of the deep-V very well and testing the ability of the high gunwales to keep spray out. Both characteristics were exceptional, and the boat powered through the washing-machine of the race start easily and relatively dryly. Doing high-speed turns in this boat is easy and fun: it heels strongly over when pushed hard, but feels safe and in complete control. The big Volvo easily pushes the 2200kg hull up onto the plane, and although trim tabs were fitted we did not feel the need to use them. However, some fine-tuning of the stern leg's trim was beneficial in getting the bow down for high-speed running. Although the boat's top speed wasn't tested, it certainly takes off like a scalded cat and we quickly reached speeds well in excess of 30 knots. Atomix states a top speed of 38 knots with the smaller Volvo Penta, so this model should definitely be capable of over 40 knots. As it is stored at the Orams boat park, we were not able to review the test boat's road trailer. However, despite its length, the boat has a road legal 2.4m beam and rides on a braked tandem trailer. With an all-up weight of around 2200kg, it should be perfectly manageable with a reasonable tow vehicle. With a massive 340-litre fuel tank, the boat has sufficient range for an extended trip and, of course, it has all the standard navigation lights required. And although the cabin is not really intended for more than a day trip, it could suffice if you got caught out. The verdict Atomix has turned an initial concept boat into something that will certainly challenge the market. There are very few centre consoles of this size currently available, and Atomix have learned from others. Given the extremely competitive pricing available, you get a lot of boat for your buck, and if you are into serious fishing, give this one a test run. Visit www.tradeaboat.co.nz and type "Atomix" into the search bar to view this and other Atomix models for sale.